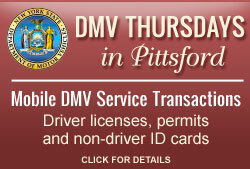 Passport Express, a service of the Monroe County Clerk's Office, is available in Pittsford Town Hall, 11 S. Main Street. The County of Monroe and the Town of Pittsford are partnering to provide "Passport Express" every Wednesday, 9 AM to 4 PM. Your application will be processed and passport photos may be taken at this mobile location. No appointment is necessary. For further information regarding passports and DMV services, call the Monroe County Clerk's office at (585) 753-1600 or visit the Monroe County web site at wwww.monroecounty.gov/clerk-passports.php.